the update information is communicated to the "FMC Airport Manager" users with the respective version. Forum members who do not use "FMC Airport Manager" : The update information are neither useful nor helpful. Developed for "FreenavDB Airport" producers. To help without laborious work on Excel .csv files. I had to enable an import. When importing the various airports, there was a crash after another. To protect the program I had to catch all sorts of wrong values. That sounds easier than it is. Considering what people can do wrong, to edit manually the approximately 7650 commas and values in a file!! If only I had the import not done. I would have spared myself a lot of time and trouble. and now : 60% of program code is only to protect the program from crash. With import of Airports that are NOT created by "FMC Airport Manager"
- Control of existing airports. - Create new airports with many help tools in the application. Only users with "FMC V.1.0.1" experience. Those who can handle the app correct, will get access to the version 1.2.0. That should protect me the developer from countless "How To : this and that". There are users who find it easy to find their way around a complex program without reading the manual. These users are always asking how is this or that. A friendly call : Please read the manual there it is described. Answer : I have no time to read the manual. If users use the program with the recommended steps. Then questions are not a problem! Contrary these are welcome! - Visual map of Airports with all waypoints that are present within a radius of 100 nm. - Typing an existing waypoint name - and the Lat / Lon setting are inserted to all waypoints with same name(in ALL .csv files) automatically. Last edited by moskito-x on 16 Mar 2018, 23:00, edited 1 time in total. So the change from the previous to the current version is mainly bugfixes? I would give the Airport Manager a try to correct at least TXL (which has a bug in a SID or STAR), but the process of applying for each new updated version and running the risk of not being picked because there are no more slots available for the month is simply too inconvenient for me. If the current version runs well enough, why not simply post it for everyone to download with a disclaimer that stupid questions will not be answered and users must read the manual before using it? Or lock the program with a password, which is hidden in the manual to make people read it. 10% are bugfixes for "FMC Airport Manager" 90% are for the already existing created Airports. Never expected such a sign at such a place. To check the values ​​of an airport over and over again and all at once makes the program terribly slow and difficult to handle. To make it fast and not to notice a delay it is divided into different sectors. These are then executed when the right time for deeper checking is available. - "OPEN" (SID STAR APPROACH): 40% of the error control. - "Line Test": 35% of the error control. - "Manual Maintenance" 25% of the error control. If an error can not be assigned exactly, the "Manual Maintenance" is called. There, an attempt is made to alert the user to detected errors and offered "Try to solve" buttons. As I said it is easier to visually display wrong values. An experienced user will soon know what's wrong and change it. An inexperienced user who has never worked with excel on the .csv files is overwhelmed. The simplest possibility is to say. Here is something wrong I just do not know what. - is it a comma in the wrong place? - there are too many or too few commas in the waypoint data. - is it because a missing comma before the data. Now all the data have moved forward one data field. - the whole waypoint with all its data is just a remnant of a waypoint data that has no consecutive number. (just forgot to assign a number. It can not help a user to inform with "Wrong value at position "LATITUDE"should be a numeric value like 123.123456"
Now the user change the value to "123.123456" but the "ICAO name of the waypoint" (due the missing comma is now overwritten) with "123.123456"
This is not a chess program that finds the greatest likelihood and then serves the solution on the silver tray. I tried to do something like this. In doing so, the airport data was destroyed more than it was to be improved. So I had to let this kind of help out to the user. Because there was no guarantee for a success to improve. Always remember. A change in the data in one place can easily have an impact on a completely different position. A comma seperated .csv file is a Database. In real life: normal databases are no longer opened with a hint. Without pointing out where the errors are. This is done for a simple reason. No database server can decide. - when writing to the hard disk a sector error arose. - The hard disk has invalid sectors or more worst case is damaged. - the database has been changed by an unwanted program. Therefore, simply the database is declared as invalid and ready. Should the user take care of a restore from a backup. This can not do my program just like that. The user is disappointed and expects help. So I offer the user a solution he should decide for himself what is wrong. This is visually much easier to do than for a software code. It offers the waypoints line by line to visually let the user decide what is missing or wrong. Here's a riddle for you. Look at next picture where is the mistake. Hint: look at the column STATUS the line with the most content (also !! are in) is the right line. but the process of applying for each new updated version and running the risk of not being picked because there are no more slots available for the month is simply too inconvenient for me. I can not know in advance how high the interest in "FMC Airport Manager" is. If you read my last post correctly, there are no more restrictions. That does not mean that will not come again when the rush becomes too big. But all accepted users have no restrictions and also not in the future. Register once and you're done. More users, more questions, more time, etc. - the manual must be completed urgently. changes and new functions have to be added. - newly discovered Airport mistakes must be treated. When I do that, I have no control over my development at all. Everyone downloads it and does what it wants with it. Hundreds of unknown people ask for help or shower me with spam. To protect my program, I had to pay 500, - euro. To a company for professional software protection. Of course I do not say what protection it is. That would only make it easier for pirates to crack it. Some download it just to disassemble the program and make a new design about building some new features and then selling it as their own program. This can be used well in other FSX applications. and users must read the manual before using it? And how can I control that. A user claims he has read it three times and still does not understand it. With specific questions, I can see that he has not read it yet. But how can I prove that, he does not say the truth. He is lying! After all, development would only be as easy as some people imagine. Clever people open the manual read a page and close it again. How should I control something like that. Is this additional effort worth the reason. The "O" should be a "zero". You're right. I've overlooked that. I do it like this: No e-mail address, no support via private messages, show people the threads they may use for support. And that's it. Why would you need copy protection for a freeware program that's only intended for a very specific purpose? Not so easy to find and can be quickly overlooked. The reason for that is easy for me to understand. I am already working on the 1.2.0 version. In order not always to switch between the versions 1.0.1 and 1.2.0 I work only on the 1.2.0 version. - if bugs are found. - new features are incorporated. - improvements in the program process are to be coded. - new errors in the existing airports are known. Then I always have to make these changes in both versions. There can be quickly forgotten a line. A different code treatment can not be completely ruled out. In short, both basic codes are always diverging more and more. Difficult to manage and keep track of. That's why I always work on just one version. All new features and improvements are always the same. With a compiler call v1 the v2 functions will not be reachable. So it is in the v.1.0.1 version everything in ... which is also present in v1.2.0. Just not available and not visible. With a compiler call v2, I can just start where I left off yesterday. But it has a disadvantage. It already happened to me that I have provided the v1 users with a version that was compiled with v2. They have wondered what v1 already can do and so many new features. Sorry for the delay, but I have found a little time this weekend to work on project. So I prepared a pack, with all A32x family updated with Bjoern's VC and nexw feature. FD-FMC gauges are now common to all aircraft in this folder. Easy now to update ! I am uploading the pack. I havn't yet completed the LEG and RTE page of MCDU, but I added a security when you want delete a waypoint of the flight plan in these page : If waypoint is in the SID, STAR or Approach, you cannot delete it, because that would occur problem in the FMC. In the RTE page, you have the information about if waypoint is in the SID, STAR or Approach. With previous version, when you selected a waypoint in the LEGS page, that change the active waypoint in the flight plan : fixed. Now, Flaps and slats Minimum speed retractation (symbol on PFD and value in MCDU) are dynamic according weight. Please note that these speed are minimum speed that you MAY retract flaps or slats. Not MUST ! Now HOLD key of the MCDU works to engage an holding pattern. Zip file takes 400 Mo ! Dll's are not provided; This pack works only if you already use a FD-FMC aircraft (Xmltools.dll must be installed). I added "2.0" at each aircraft folder name. You can keep your old aircraft version if you want. This pack can be added as new aircrafts. Not necessary to delete old gauges in FSX folder. If you add your own livreries, copy the "texture.cfg" file located in texture folder of this pack in your new texture folder. In the ZIP file, you have a folder FD_FMC with a file : "Config_A32xFD-FMC". 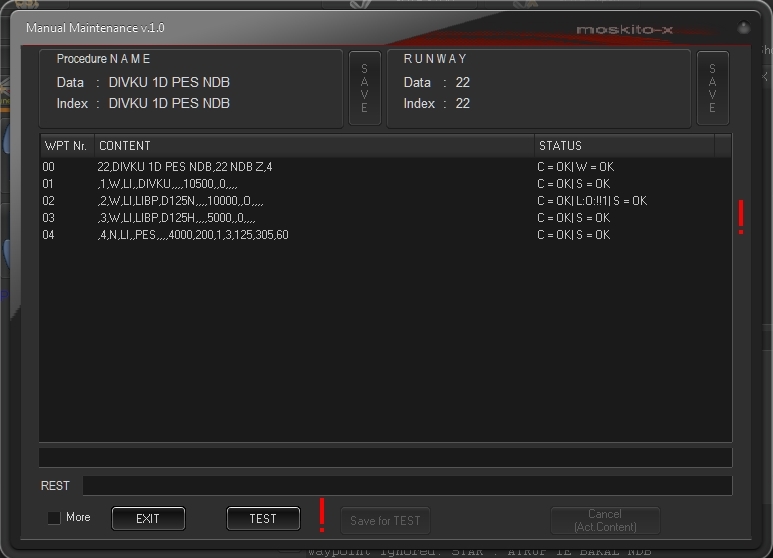 Copy this file in your FSX\FD_FMC folder. 2 missing files in the pack; I am really sorry. This is 2 bitmaps for IAE ECAMS. I have just loaded V2 up, it looks great. Finally I can see the PFD with landing lights on in P3Dv4. The AP still works for me just fine. Everything looks correct so far with the exception of two things, keyboard or fsuipc commands for lights don't work, they flip on for a fraction of a second and then turn off. I used the 4096 textures and it looks a bit wrong around the AP button as there's 2 sets of buttons there. I will try the 2048 textures and see if they are ok. I finished my first flight, overall, amazing job! -The N1 take off limit stopped the red line take offs even at max flex. -The Nav worked perfectly, has the climb and descent coding been worked on? Everything seems to be so much better, even the slow down at 10000 feet. -I figured out the lights problem, you changed to lvars which I can use so not a problem. The textures were user error. -I changed, the climb from 85% to 87%, when I typed in 8, the wrong value error came up but didn't disappear when I entered the 7 and pressed the button. -Int LT off turns off all the displays, the on setting doesn't seems to light up the cockpit. -The backup instruments seem very, very bright. Any chance they could be turned down a bit or linked to an ecam brightness switch? -No vref on airports not in the database. 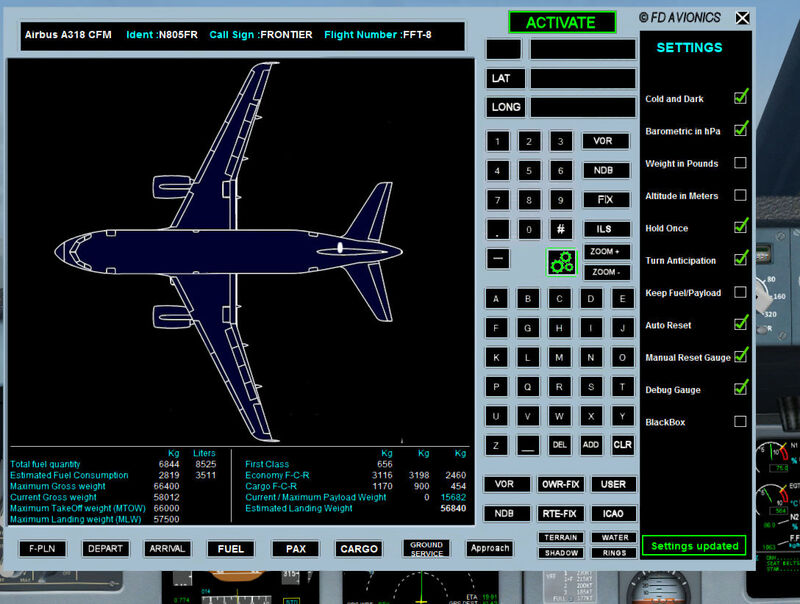 I couldn't find the altitude to switch to approach mode, it would be nice if the user could do that at any time by pressing "select APPR" in the new FMC. I think I will using the v2 release as my FD planes now. Also, is there a 64 bit version of the 2 gauges in the common folder? I checked 3 VC light criteria for all aircraft with quite different results. VC doomlight function / ECAM dim light does not work / Overall cockpit light during night (doomlight unswitched) much too bright . Hmmm, I flew the A318 and the cockpit was dark apart from when the taxi or landing lights were on, the white lights shining down were ok. So are you saying the A318 cockpit lights up from the cabin lights and also the ecams work even with the Int lights switch to off? A318: The OVHD INTEG LT must be switched on during night and the VC looks fine as expected, otherwise the VC is nearly dark. The DOME LT can be switched on too and there is a slight additional lighting within the cockpit (it could be a bit more, but this is q of taste). The illumination/ brightness from all 4 glass panels (MFD,ND,ECAM, below ECAM) look fine and can be dimmed individually. Everything looks correct so far with the exception of two things, keyboard or fsuipc commands for lights don't work, they flip on for a fraction of a second and then turn off. That's because they use custom gauge code which ultimately controls the FSX/P3D internal lights. Use the VC controls. - E: Ah, you already found out. Haven't we discussed this before? I had the displays set to 50%, that's why they switched off because they were so dark. Turning them up to 100% brings them back. Yes we did but the sounds gauge is a huge 648kb while the DD one is 175kb so I assumed it was a different gauge. I matched up the other one fine because they were the same size. I didn't remove the post as I thought it would be something else considering it's 4 times the size of the one one the DD site. Another bug, slowing at the 10000 feet point worked once and then I blew through it 3 times without any attempt to slow down or pitch up to adhere to the 250kn restriction. Everything I have posted is about the A318, I will try the A321 CFM tomorrow. Coki, if you are around, you asked what you could do with textures. The whole new cockpit looks great with the exception of the 5 buttons above the map range selector. Everything else is pin sharp. I can confirm Wulfs findings on the A319 and A321 CFM, also, in the A321FCM, switching off the cockpit light (even though it doesn't work) really does switch of the displays, even at 100%. Sorry for the new post but I am fixing the lights. For the A321, overwrite these lines. These should give you a dim light with the middle click and a pretty bright light with the upper selection. The former good for flying and the latter good for pre flight. yes, sorry, I forgot to edit the dome and pilots's night light with the Bjoern's VC location. Currznt values were to old VC. I duplicated the background bitmap by adding a "night" suffix (A32x_FMC_Dummy_night.bmp) ....no effects. Sorry I don't understand what's happens. information : I renamed A32x_FMC_Dummy.xml in A32x_MCDU.xml in this panel. When you will have a little time to check this issue...not urgent. The favourized VC internal light definition can now be generally adopted to all 7 Aircraft versions, because the VC is fully standardized for all versions and located in one position (independent of the aircraft length). No need to vary, but all VC internal lights will be looking the same in all aircraft. In addition I adopted my favourite "eyepoint = 45.5,-1.74, 3.8" definition from the A320_CFM to all 7 aircrafts too. 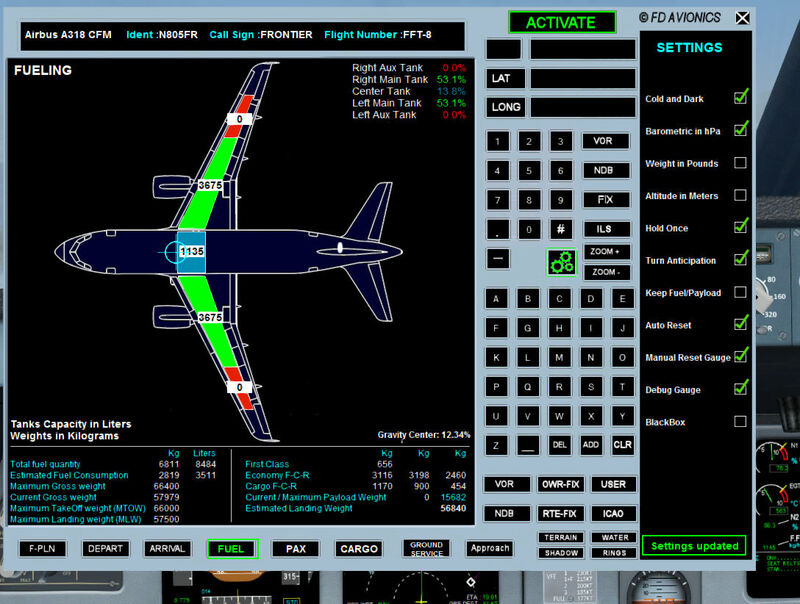 To Flyer10: Your VC light approach for the A321 looks fine, a good alternative. Please be aware that there are 2 different effect files "fx_vclight" and "fx_vclighth". Both work fine but need quite different "virtual" light positions/coordinates as shown above. That's probably because the developer left some debug code in. It doesn't alter the functionality, but it's there. Those buttons have nothing to do with the VC textures as they are basically gauges. If you want, you can try to move the cockpit to the positions appropriate to the A318, 319 and 321. The new ModelConverterX releases do not seem to have the clickspot bug anymore. The visibility conditions are in line 650 and 658, e.g. 2. Time of day must not be "day"
3. For the orange MCDU, the "title=" line of the [fltsim.x] entry in the aircraft.cfg must contain "PNL_LT_ORANGE" (no quotation marks), otherwise the white one will be displayed. I don't have any motivation for the Airbus at the moment, so I can't do any real bug fixing work. All 3 IAE versions have the same ECAM problem: not dimmeable, the checklist click spots (in the botton left) do not work properly. Hi thank you! Does it include Bjoern latest modifications? Yes, from what I can tell it looks 100% like Bjoerns VC but uses the FD autopilot which means you can use hardware or buttons to control it. Hi Flyer10, not properly the latest. I don't doubt that but I can't tell ant difference in the VC although the AP control is quite clearly different. The Airbus_A320_Int_Mod.mdl dated 19/11/2017 includes e.g. the remodelled engine start switches with a double-click-security and the remaining light switches on the OHP. All the additional features only work properly with an updated system related xml (Bjoern provided the system related files in Nov. too). I hope that Francois integrates this addon in a further A32x release. Sorry for VC model error. Current gauges works with the 19/11/2017 VC except Seatbel and No smoking switch. I have updated and fixed Overhead gauge and A32x Common gauge and I will upload in few minutes with lastest VC. Prosdocimo, I don't know how to work with alpha channel on bitmap. Have you found a solution to black texture ? Someone get the texture ? Is anyone else having the same problem that the radio stack doesn't come on? Thanks for your help and solution. Yes, I would like to get your bmp file. the engines can not be started although the engine starter is correctly engaged (double click) and the Cockpit int lights at night do not work although switchable. - Autostart is still possible"
Thanks, Prosdocimo. Unfortunately I am unable to start one engine even switched to crank and fuel cross feed open (Ctrl-E works to start engines sequenced). The light prob persists. Prosdocimo has fixed VC night texture to solve the transparent issue when panel light is on. now, texture is ok in VC. I remains the issue only with the 2D gauges. Many thanks to Prosdicimo ! So, other thing, if someone can explain to me what is the "crank" mode to start engine ? Block igniters and then run the starter. Useful for clearing vapors or pools of fluids from the engine or preinjecting some fuel. Don't exactly know where else to put this but I edited the cockpit textures based on CokiBH's so the flap indicator now has positions 1, 1+F, 2, 3, and Full, and I couldn't find any way of contacting him but I'd like to share them. I know it's a small thing but I like being able to check the flap handle and know for certain where the flaps are. If anyone can put me in contact with the FreeNav team or Coki, I'll send them across? Also free to work on any more texturing if I can lend a hand? Those textures would be wrong, 1 and 1+F are the same detent and the computer decides when to use each one. If we’re planning a departure, we want our flaps out, not just the slats. Airbus logic knows this and the flaps will extend too. Anytime we’re retracting from flaps "greater than" 1, the flaps will stay at 1 until we move them to "O" position. When won't we get flaps 1 when we select the 1 position? When airborne and we go from a clean wing to flaps 1 selection we only get the slats. Flaps will not come out until we select flaps 2 position. When flying this plane everyone knows that Flaps 1 on arrival doesn’t really do a whole lot for slowing their plane. Do they know why? I'm not sure how many remember that we don't even have flaps when we select 1." While that's true, the current aircraft doesn't simulate that, and 1 and 1+F use different detents, If and when it gets simulated, the textures as they are would work, but for the mean time, they don't.